Securing affordable housing in Silicon Valley can be a lottery. In one case, a group of tenants is literally hoping the lottery will save their homes. The homes are the 59 apartments located at 2310 Rock St. Each week, the residents -- including bus drivers, teachers and nurses -- are pooling their money to buy Powerball tickets with the distant hope of hitting the jackpot. It started as a joke, they said, but if they win, their plan is serious: Buy their apartment property, giving everyone free or very low rent for life. It's the American dream tempered for the realities of Mountain View housing. The Hail Mary plan to buy lottery tickets is a testament to how desperate tenants have become. The family that owns the Rock Street complex intends to raze the apartment buildings and replace them with for-sale townhouses. If the plan goes forward, many tenants fear they will lose both their homes and their ability to stay in Mountain View. In effect, the redevelopment plans would replace 59 old rental apartments with 54 for-sale homes. In all likelihood, these new homes would be priced well out of reach for any current resident, said Jacqueline Cashen, who has lived at the Rock Street apartments for 15 years. 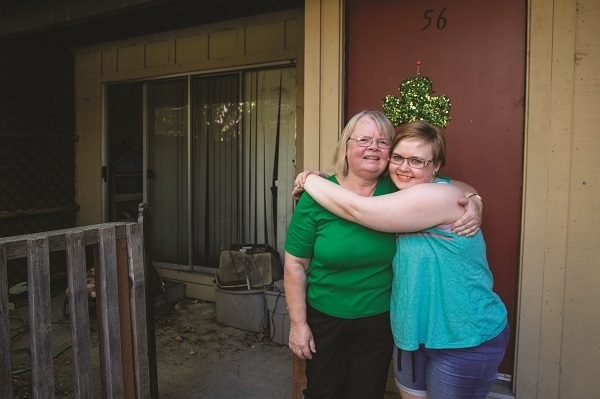 Cashen currently pays about $1,100 a month for her one-bedroom apartment, and she expects to pay more than double that amount if she tried to find a new home in Mountain View. Cashen points to a rowhouse project recently built next door, where homes sold for up to $2 million apiece, as a template for what's to come if her apartment is demolished. "This would be replacing our apartments with less housing that we won't be able to afford. There's not a single person who will be able to keep living here," Cashen said. "Some of our neighbors are genuinely concerned about becoming homeless." Dividend Homes, the developer behind the 2310 Rock St. project, declined the Voice'srequest for comment. The Rock Street tenants' situation isn't unique. Possibly as a byproduct of citywide rent control, many property owners have been looking to exit the apartment business. They are pushing forward plans to convert older rental units into ownership housing, which can fetch premium prices. Several apartments are also on the chopping block. Near Cashen's home, 20 apartments at 2005 Rock St. are proposed to be rebuilt into 15 for-sale homes. In the same neighborhood, a 32-unit apartment complex at 333 N. Rengstorff Ave. could be demolished to build 31 rowhouses. Thirty-four apartments at 1950 Montecito Ave. could make way for 52 ownership homes. Since 2015, approximately 740 households in apartments across Mountain View have received notices to vacate based on plans to redevelop, according to data collected under the city's Tenant Relocation Assistance Ordinance. City housing staff point out that some of these apartments might still be inhabited because the owners are waiting to obtain city approvals to redevelop the sites. On the plus side, city planning staff said the redevelopment spree should result in more than triple the number of homes that were lost. But tenant activists in Mountain View and throughout the Bay Area have complained that the vast majority of new housing is priced for the well-heeled who can pay $3,000 or more per month. "A lot of developers are interested in Mountain View, and unfortunately it's changing our community for the worse," said Guadalupe Rosas, an organizer with the San Jose-based People Acting in Community Together. "Most people who I talk to are saddened to see how their children have to change schools and lose teachers and family." This trend presents some tricky questions for elected leaders, who all voice support for housing growth, although they differ on many aspects of that goal. City Council members generally endorse the idea of building ownership housing, but they are reluctant to bulldoze cheaper apartments to make space for it. Mayor Lenny Siegel, who met recently with the 2310 Rock St. residents, said he was inclined to oppose the redevelopment plans. After hearing the residents' stories, he learned that the complex has many seniors and public-service workers who would have little ability to find other housing in the area. "These are people who we can't afford to lose," Siegel said. "We have enough opportunities here to develop properties profitably, and we don't need to demolish housing to do it." Yet even Siegel has supported past projects to redevelop older apartments. Last year, the council approved the demolition of at least 116 rent-controlled units. The mayor described these newer proposals as different. In particular, tenants who would be displaced are getting better at organizing in opposition and explaining how they would be impacted, he said. But opposing the project might not purely be a political decision. Siegel acknowledged that the council may have its hands tied if the project is fully compliant with city codes and zoning. The mayor said bluntly that he is searching for legal ways to oppose the project. At the Rock Street apartments, the tenants have all been served with notices that they will likely need to move out in the coming months. Most tenants qualify for relocation assistance, meaning they are entitled to receive the equivalent of at least three months of rent to help them find new homes. The project is reportedly scheduled to be reviewed by city leaders later this year. Many tenants have already started making some tough decisions about moving out of the area, Cashen said. One married couple is considering splitting up because the husband needs medical care in California while the wife would move in with family in Texas, she said. A cascade of projects like this will result in pushing the working class out of Mountain View, she said. "Pretty soon, Mountain View is going to be another rich enclave like Atherton or Portola Valley, and we'll lose ethnic diversity and income diversity as well," she said. "It'll be like being in a hospital with 100 doctors and just one nurse."